After being lauded last week for making Venezuelan history by knocking out Cerro Porteño to qualify for the Libertadores, Táchira were handed a crushing reality check in their first group game as Racing’s dynamic partnership of Gustavo Bou and Diego Milito ran riot. While Táchira always knew it was going to be a taxing encounter against the Argentine champions, at least keeping the scoreline respectable seemed an achievable aim – a task which they were to fail miserably at in front of a full-capacity Pueblo Nuevo. 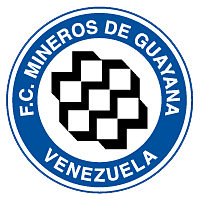 As has been a recurring theme for Venezuelan sides at club and national level, while Los Aurinegros were not entirely overawed in the opening exchanges and enjoyed some attacks of their own, when their opponents made their first breakthrough, it did not take long for any game-plan to disintegrate. 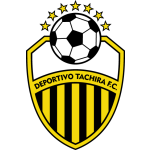 Indeed, before the opener, Táchira had managed to get forward, with Yohandry Orozco and Pablo Olivera in particular working the flanks, putting in some testing balls and causing some minor melees within the Racing area. However, their forward forays were little to shout about in comparison to those of the Argentines who had nearly scored after three minutes when Orozco poked a clearance inches wide of his own goal and then on 14 minutes when Bou was granted space to drive a shot against the post. Bou perhaps should have finished off this opportunity, but he was to more than make up for this over the course of the game, starting with his involvement in the first goal. Indeed, in the 21st minute, from the left edge of the area he drove a grass-grazingly low free-kick into the crowd of players where it trickled through for Luciano Lollo to get the faintest of touches to direct it in between goalkeeper Alan Liebeskind’s legs. Although some Racing fans were on hand to greet the goal, an abrupt silence suddenly descended upon Pueblo Nuevo’s sea of yellow-and-black hordes, who were represented by twice the number that witnessed the home leg of the Cerro Porteño tie. Subsequently, while the hosts did attempt to mount some of their own attacks, their more decorated opponents always looked the likelier to extend their lead, with midfielder Marcos Acuña forcing a decent Liebeskind parry from a 35-yard strike not long after the goal. If there were any lingering doubts over this outcome, they were all but put to bed in the 40th minute when the second of Racing’s rout arrived, sensationally demonstrating the gulf between the two sides. In a fantastically worked move that started on the right, Acuña’s pass was dummied by Milito, who then ran into the area to receive Bou’s pass, only to return it back to his younger accomplice who controlled then fired home spectacularly from just inside the box. Bou, who turned 25 less than a few hours after the game had ended, is something of a late developer, having been reared at River Plate where he failed to make his mark with the seniors or, to any noteworthy degree, on any of his three loan spells. When his River contract was not renewed and he was subsequently picked up by Racing last August, few were envisaging him becoming the club’s top scorer with 10 goals in 15 games, striking up a fine partnership with Milito that fired the side to their first title win since 2001. The understanding between the pair was there for all to admire with this goal, but when the third went in after the break in the 53rd minute, it was entirely Bou’s to savour – much as goalkeeper Sebastián Saja and data analysts may wish to claim otherwise. Indeed, erstwhile Argentine international Saja – who was embarrassingly at fault at the weekend for the winning goal in Racing’s opening day loss to Rosario – officially received an assist after hoisting a clearance forward that reached Bou on the right edge of the area. However, standing back-to-goal with a defender hot on his tails, the ingenuity involved here was certainly all Bou’s, as he took one touch then rapidly turned to fire an unstoppable shot into the top right-hand corner. To ask observers to pick the best goal from this and the one that preceded it is perhaps to open up a rift between differing sensibilities, but what is not in doubt is that they were both converted by the man of the match who is enjoying the most successful spell of his career. Bou was on hand just a few minutes later to turn provider for Milito as, from a central position, he slid a through ball between Táchira’s static defence to the former Inter Milan striker. Though fatigue may have been a factor, nobody tracked the man whose two goals won the 2010 Champions League final and he had all the time in the world to first feint, then dink, the ball past Liebeskind. Just over ten minutes later with increasing amounts of space being offered to the visitors, Uruguayan Washington Camacho, a recent recruit from Defensa y Justicia, roamed forward to play a through ball to the right side within the area. Here, Milito again had the freedom of San Cristóbal with no defenders within ten yards of him as he passed first-time across the goalmouth where Bou hooked the ball home to complete his hat-trick and his side’s triumph. 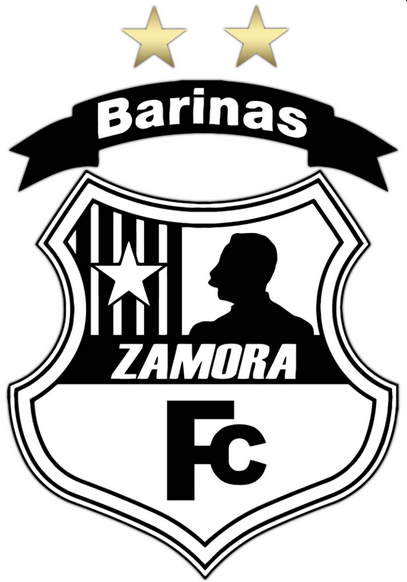 Racing’s supremacy was plain to see and, a fine parried Francisco Flores effort aside, Táchira barely had any clear chances in the second half until five minutes from time when substitute José Alí Meza was brought down for a penalty. Up stepped 37-year-old veteran Jorge Rojas, Venezuela’s third most-capped player of all time and who, more to the point, had converted a penalty in each of his last three consecutive league matches. Yet no consolation could be offered to the ever-dwindling number of home fans as the supposed Mr. Reliable could do no better than blast the ball well over the bar with a shot that was hit with such venom it comfortably cleared the athletics track surrounding the pitch. Although there may have been significantly less people left at the final whistle, around 38,000 people paid to see this 5-0 whitewash, a figure that is approximately four times greater than their average league attendance. 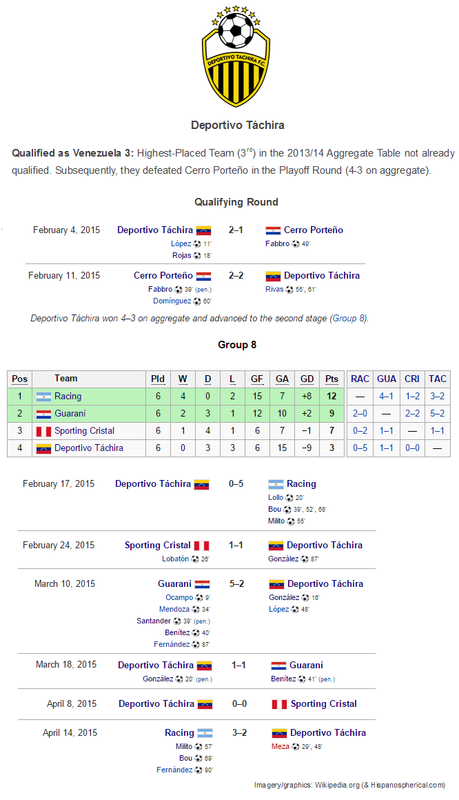 Given not only this result but their next Libertadores home opposition in early March, Paraguay’s Guaraní, if Pueblo Nuevo is even half full for this game, then Táchira ought to be pleased. 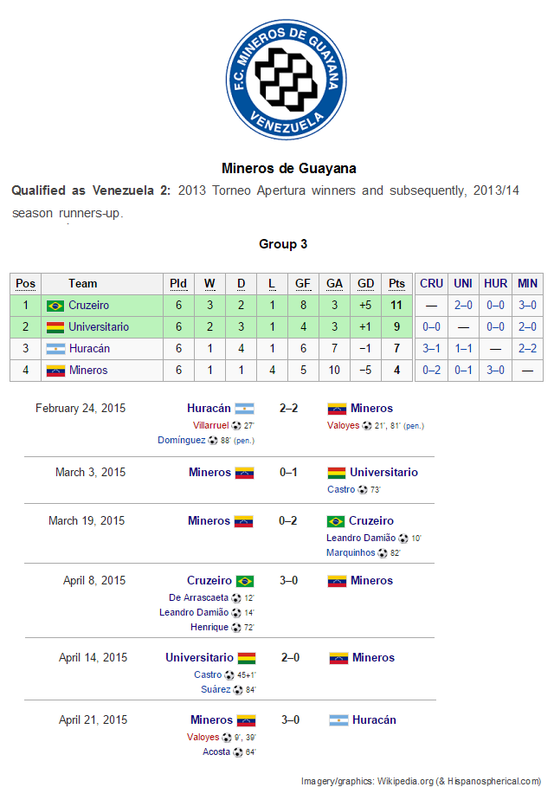 Before that, however, they travel to Peru next week to face champions Sporting Cristal – who let a two-goal lead slip to draw 2-2 away to Guaraní – a game in which at least drawing will seem necessary in order to retain any realistic hopes of reaching the next stage. In the meantime, after this humiliation they will have to reconsider how to negotiate their path through this group with the dubious consolation that, having now faced a strike-partnership that could well fire their side all the way to the final, the only way is surely up. 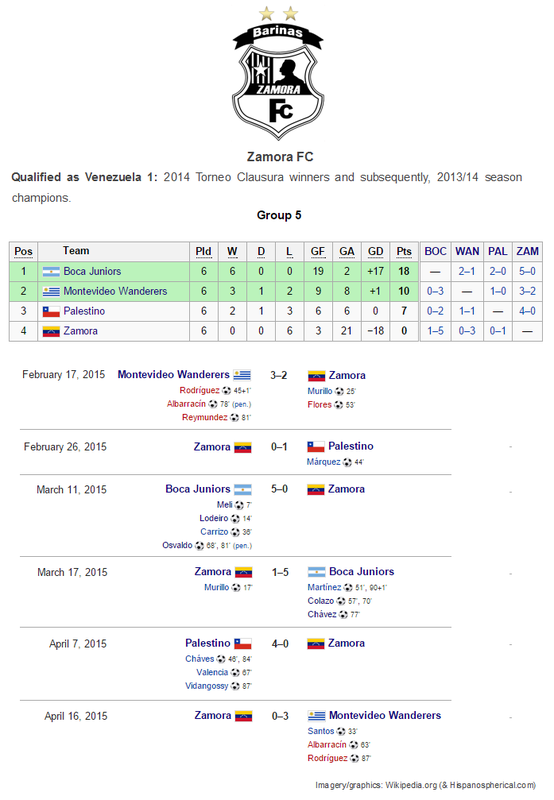 This entry was posted in Copa Libertadores and tagged 2015 Copa Libertadores, Alan Liebeskind, Argentina, CONMEBOL, Copa Bridgestone Libertadores, Copa Libertadores, Copa Libertadores de América, Copa Libertadores in English, Deportivo Táchira, Diego Milito, English Copa Libertadores Coverage, Francisco Flores, Gustavo Bou, Jorge Rojas, José Alí Meza, Luciano Lollo, Marcos Acuña, Pablo Olivera, Polideportivo de Pueblo Nuevo, Racing Club, Racing Club de Avellaneda, Venezuela, Washington Camacho, Yohandry Orozco on February 21, 2015 by hispanospherical.